Having said our last goodbyes to Popoyo we made our way to the Masaya region, an hour south of Managua and just east of Lake Nicaragua. 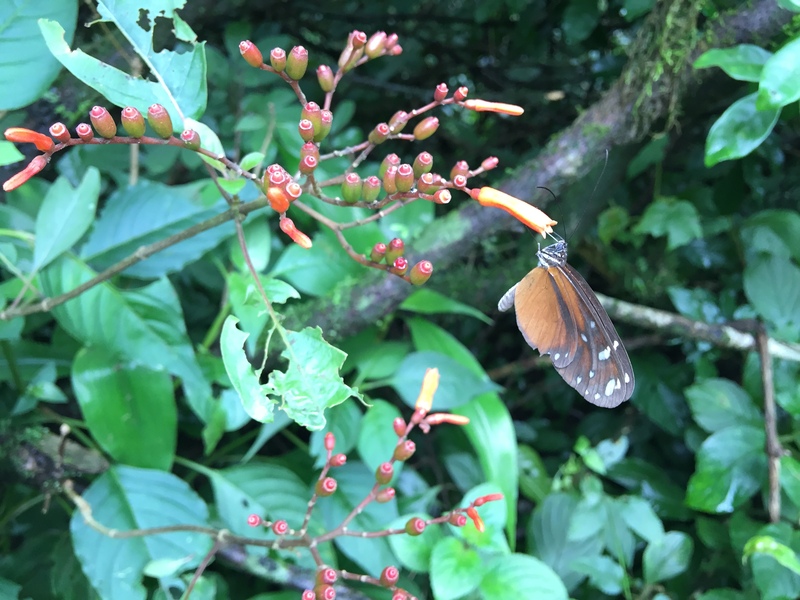 We spent our last two days at the magnificent El Respiro Ecolodge. Sitting 350m above sea level it is nestled perfectly between Volcan Masaya, Volcan Mombacho, Laguna de Apoyo, Granada and Lake Nicaragua. Run by French couple Emi and Romain, El Respiro (‘breath’ or ‘break’ in Spanish) took 3 years to complete including their new home, 2 B&B rooms and small working farm. 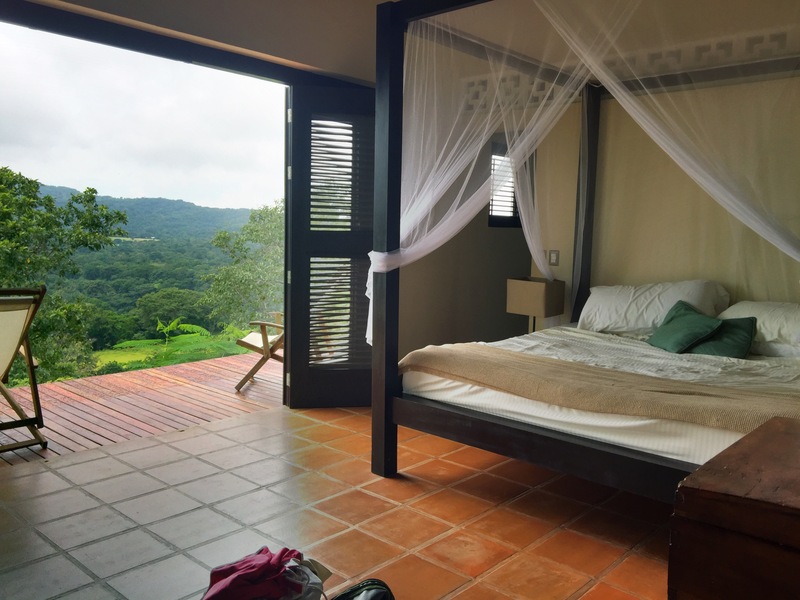 They collect enough rain water through the wet months to keep them going for 3 months and heated by solar power throughout the day provides hot showers showers with breathtaking views in the outdoor style bathroom. We fell asleep to the sound of the sprawling forest. With only 2 days left of our 14 day trip, we had a lot to pack in, aiming to see as much of the natural delights on day one and mooching around Granada on our final day. 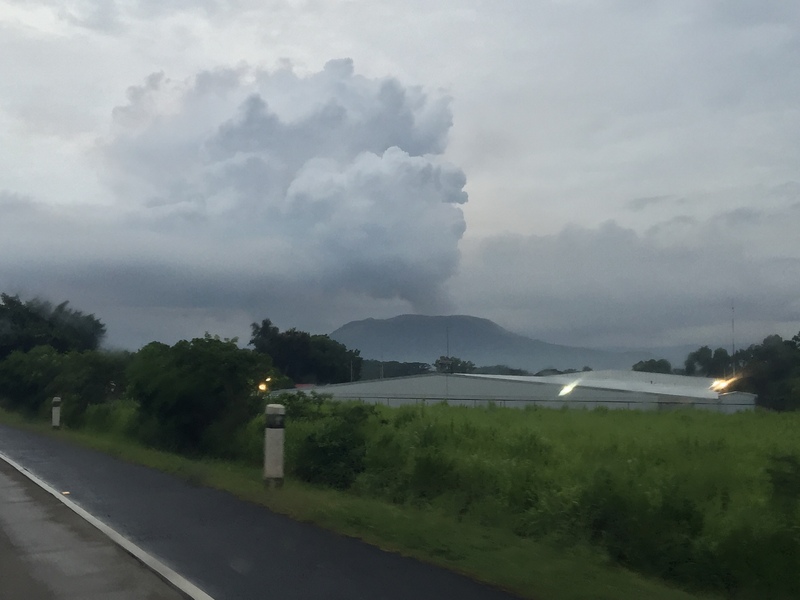 We woke up to see the clouds hovering over the 1400 meter high Volcan Mombacho (‘Mother of our Lands’), rains having fallen throughout the night. On arrival, we contemplated walking to the top, but we’re so glad we didn’t. The 45 degree (yes, 45 degrees!) roads are, let’s say, steep. After a quick inspection by guides, our little 4×4 just about managed to get us to the top; with a short stop part way up to look in the coffee-shop. At the summit, we were greeted by a guide who took us into the small museum and gave us a quick run-down of the history, scale of the park, the cloud-forest and the different types of nature that resides: 50 species of mammals, 174 species of birds, 30 species of reptiles or amphibians and 750 different species of flora. 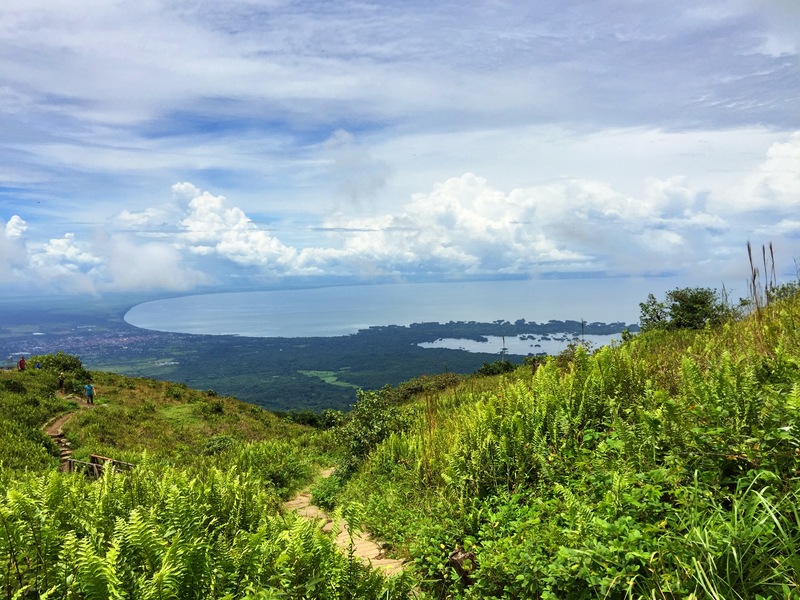 With our walking boots and mosquito repellent on, we took to the cultured paths to explore the 1km crater of the extinct volcano on the look out for some of the above mentioned animals and views over the lake. Unfortunately no howling monkeys, green frogs or sloths for us that day. With so much to explore here, you could easily spend the day. A word of warning though, it’s not cheap, but given the effort put in to protect this beauty it’s worth the money. 4×4 access with 2 passengers and a walk around the crater cost $36 USD. If you don’t have your own 4×4, provided bus will cost $20 per person plus $2 for the crater walk. Buses apparently leave from the top/bottom every hour so be prepared to wait. Six kilometres in diameter, Laguna Apoyo was formed approximately 23,000 years ago after a strong volcanic explosion, visible in it’s entirety from the view point at Mirador de Catarina. At 200m deep, it’s thought to be the country’s deepest crater-lake. A sleeping volcano, hot springs still warm the water. And, with numerous hotels and hostels tucked along the shoreline it’s a great place to chill out, even if it is raining. We spent the afternoon at Paradiso Hostel & Restaurante. For $6 we were provided access to the facilities of the hostel including sun loungers, kayaks and inflatables. Provided with a tab on arrival, we were able to eat and drink in the restaurants and bars on site and not worry about paying until the end of our day. 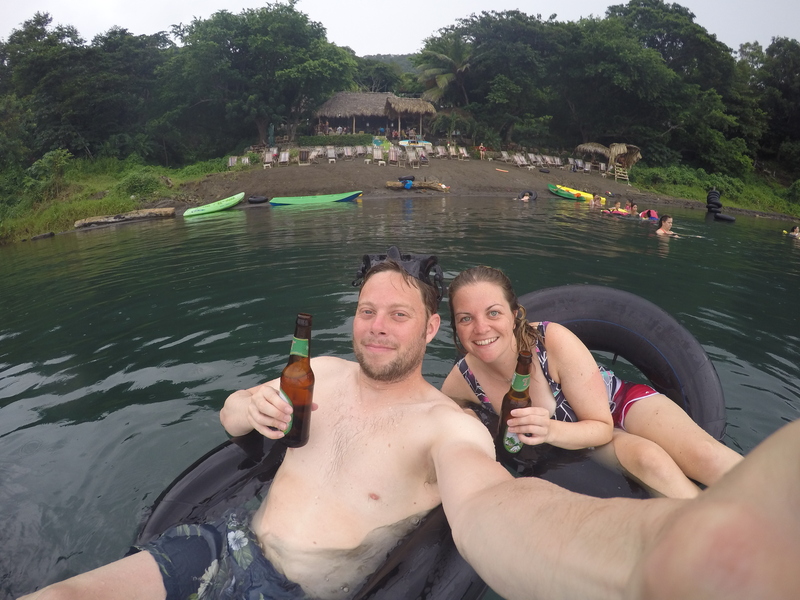 There’s no denying Laguna de Apoyo is popular with travellers and back packers, however even we were able to enjoy the lake as if we had it to ourselves. We may have been coming towards the end of our trip. But this is what I’d been most excited about. Another volcano? You ask. Well, it’s not just any volcano. It’s A LIVE VOLCANO! Located in Nicaragua’s first and largest national park, Masaya Volcano is visible for miles; belting steam high into the air from the “mouth of hell”. (If you land or take off in day light, be sure to nab a window seat to spot this beauty from above). 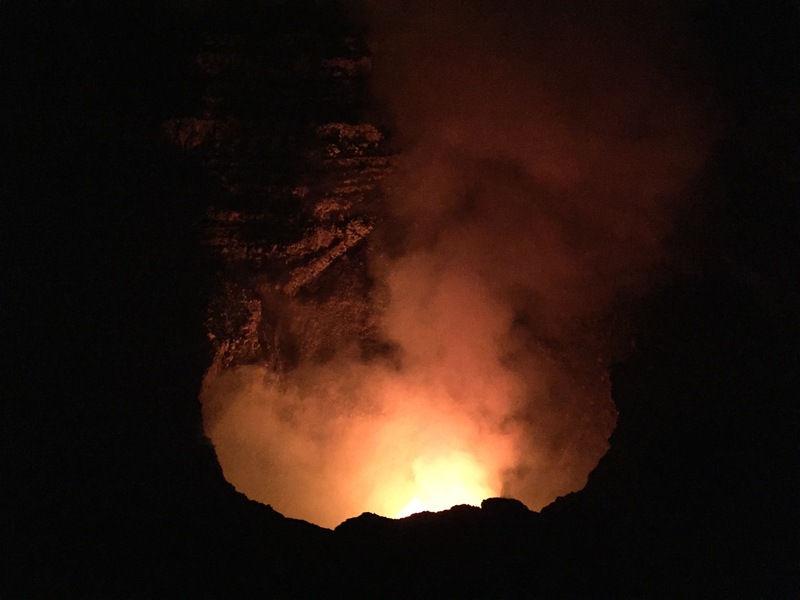 History writes in the 1500s, Friar Blas del Castillo and Gonzalo Fernandez de Oviedo lowered themselves into the crater on ropes; the glow of the molten lava luring them to what they believed to be gold. The park and volcano is open daily from 9am – 4pm and costs $100CS providing access the site and resource centre. It then opens again 5.30 – 7.30pm for those, like us, keen to experience the bright red glow from the “mouth of hell”. 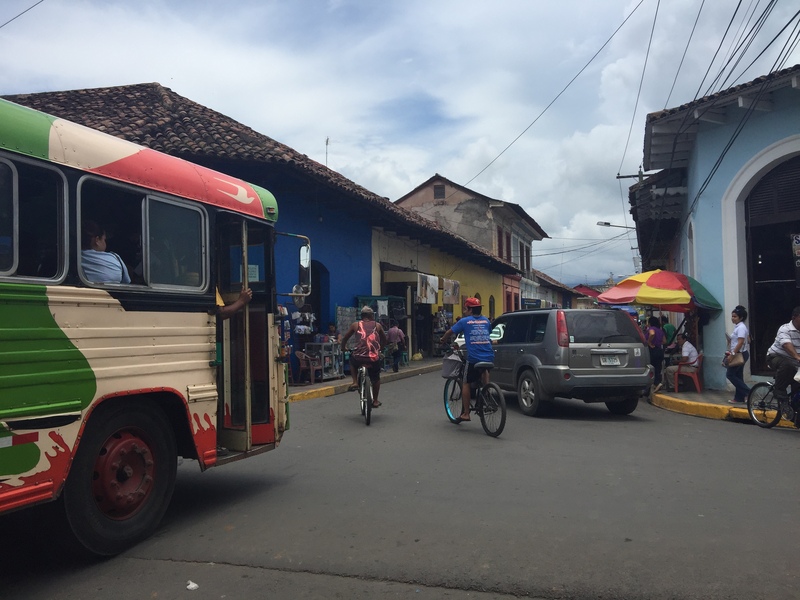 Some form of vehicle is required to enter at this time at a cost $10 USD per person. Since revamping the tour a couple of months ago (it used to be a guided sunset tour to the bat-cave), the night entry has proved extremely popular. We joined the road-side queue at 5.30pm and were 2nd-to-last group to be let into the site at 7pm. We may have had to wait for 90 mins, but boy, the 10 mins at the top was worth the wait! Yet another bucket-list item ticked. 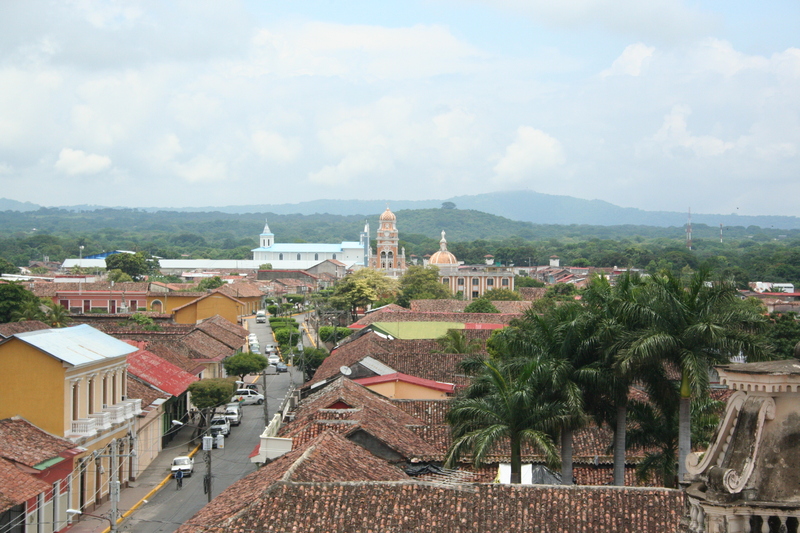 Not to be mistaken for the Spanish city of the same name, Nica’s Granada sits on the shores of Lake Nicaragua. Larger than Leon, it’s also more colourful and has a more cosmopolitan feel. Dominated by churches, it’s rich in heritage, having survived volcano eruptions, earthquakes and pirate invasions. On the day of our visit, it was over cast with little wind and EXTREMELY HUMID! With everything we’d travelled with in the car, we found a secure car park for $20CS on Calle Real Xalteva. Also situated on Calle Real Xalteva, Iglesia La Merced is 1534 church with great views over the city. You can climb the steep spiral staircase of the bell tower for a couple of dollars. It also provided a little fresh air from the very stiff humidity. Located in the front of this 5-patio mansion hotel, the chocolate museum is a surprising retreat from the heat. We may not have made their all-you-can-eat breakfast buffet but we did have an insightful tour on the history and production of the Nicaraguan cocoa bean (and a spanish lesson). And, no tour of a chocolate museum would be complete without tasting all of their delicious products including spreads, tea (wish I’d bought some!) and of course liqueur. If you love chocolate, I highly recommend popping in here, whether you chose to have the tour or not. There’s no charge, but pay-what-you-wish in tips. Plus, the building is worth a mooch around anyway. We just wish we’d popped our swimming kit in our bags to enjoy a pool dip with lunch. A couple of blocks along from the Chocolate Museum is Mombacho Cigars. Besides cocoa, rum and coffee, tobacco also remains a firm Nicaraguan industry, the second largest producer in the world and larger than Cuba. Once the home of Mario Favilli, an Italian architect who built many notable structures throughout Granada in the early 20th Century, Mombacho Cigars is a working factory, selling 200,000 puro’s; 100-per-cent Nicaraguan. Unfortunately at the time we wish to visit on our busy schedule, they were closed for lunch. But, for $10 you can get a tour of the factory and learn how to roll and keep your own cigar. The heart of the city, tall palms line the cobbled streets adorned with brightly coloured horse-drawn carriages, over shadowed by the bright architecture of the Templo de la Mùsica, the bright blue Cathedral de Granada and four museums. In the centre, a small market offers hand-made and local crafts. A must visit for delicious and sustainable food. The Garden Cafe restaurant and shop is housed in a beautiful old colonial style home. Both generate 30 full-time jobs which positively impact over 100 family members and works with 50 key, local providers adding value to the local community through the different social impact programs they support. Check out the rest of our Nicaraguan trip here.